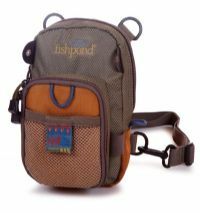 The compact San Juan Vertical Chest Pack is designed for the angler who likes to travel light. Zip-down fly bench with its high-density rippled foam fly page provides a convenient place to change or store flies. The zippered main compartment holds a fly box and other accessories, while a zippered interior pocket provides safe storage for keys and other valuables. Chest and waist straps hold this low profile pack securely against your chest. With the San Juan, you can eliminate all but the basics and feel comfortable that you've still got everything you need.